Synereo crowdsale is launching today – March 23rd 2015, 8:00 PM GMT. The AMP token is a cryptocurrency deployed as a meta-coin on top of the bitcoin blockchain, using the Omni-Layer. 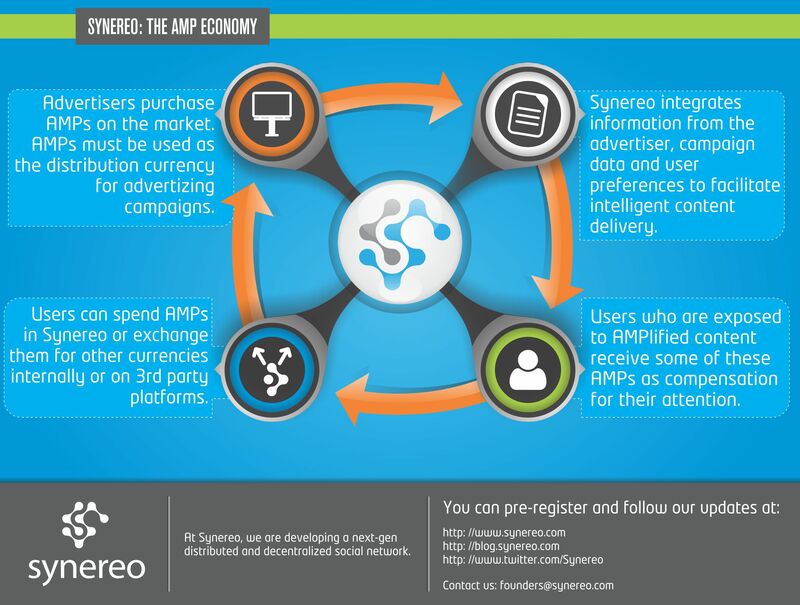 The value of the AMP token comes from its inherent use in the Synereo network, as a means for paying for user attention. The Synereo crowdsale is supervised by the Omni Foundation. The Omni Foundation has access to all transactional information, with their executives serving in the role of trustees for the AMP tokens. Synereo has no access to these funds without their approval. Synereo is taking great care to secure and safeguard all funds for this crowdsale and beyond. This document will detail the policies and mechanisms put in place for this purpose as well as for the AMPs issued and not yet distributed. The entire amount of issued AMPs, one billion (1,000,000,000), will be generated by Craig Sellars, Co-founder and CTO of Tether and Technologist for Omni. Craig will act as trustee for all initial AMP transactions, under a multi-sig solution requiring his approval to be used, allocating them to different wallets. Craig will further act as a trustee and evaluator for some of these wallets, as described below. Craig will oversee AMP use and ascertain that it is done according to the following bylaws. Wallets holding AMPs to be distributed will be published before the crowdsale begins and remain transparent to the public. 1) Crowdsale Wallet. Upon the completion of the crowdsale, Craig will overview the records and approve that AMPs are sent only, and in direct proportion to the funds submitted, to the participants in the sale. 2) Future Crowdsale Wallet. This wallet will be sealed until such a time that we announce another public offering or come into a formal agreement with an established investor to purchase AMPs. 3) User Reward Wallet. This wallet will be sealed until the Synereo platform goes live, at which point it will be used to compensate users who migrate to the network. 4) Content Creator Reward Wallet. This wallet will be sealed until the Synereo platform goes live, at which point content creators will be able to register for the reward program. AMPs will only be sent to the addresses made public by these content creators upon their registration. 18.5% will be placed in the Crowdsale Wallet. 10% will be placed in the User Reward Wallet, used to compensate users as they join the network and invite others, contributing to its growth. 7.5% will be placed in the Content Creator Wallet, given to content creators who begin operating on the network. 10% will be placed in the Founder Reward Wallet, awarded to the founders of Synereo, vested over a period of 30 months. 11.5% will be placed in the Bounty Wallet, awarded to contributors and developers. 42.5% will be placed in the Future Funding Wallet. We aim to have two more funding rounds, spaced 1-1.5 years “amapart, each providing the necessary funds for the next leg of the project’s development. The User Reward Wallet and Content Creator Wallet may only distribute the allotted rewards in a staggered manner, over a period of six months. 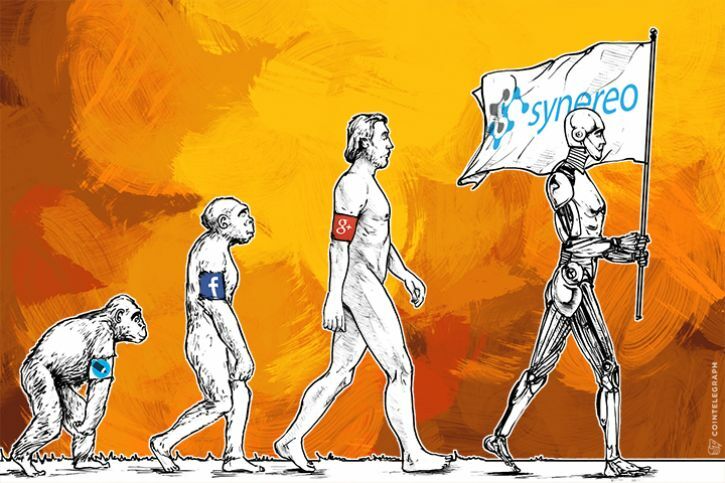 This assures that rewards will not be quickly liquidated, increasing the chances of them being used in the Synereo platform and contribute to the AMP economy. Users with accounts that are eligible will receive their weekly allotment during this period. The Founder Reward Wallet will also distribute funds over the longer period of time of 30 months, as also described in the Vesting clause of the Synereo Ltd. Founder Agreement. Each month, the founders will receive 1/30 of the AMPs allocated to them. As part of the Proof of Social Contribution (PoSC) mechanism, up to 5% more AMPs will be generated each year (note that this is lower than the year after year growth in both user numbers and market value for social networks over the past 15 years). AMP generation will also depend on the approval of Craig, making certain that this cap isn’t crossed. If the cap is not reached in the upcoming crowdsale, unsold AMPs will return to the Future Funding Wallet, holding the AMPs kept for future crowdsales and investments. This wallet can only be accessed pending the review of Craig, who will have to ascertain that their use is as defined. All bitcoins received during the crowdsale will be kept in a multi-sig wallet, generated by Armory Lockbox on offline and/or air-gapped machines. Transactions cannot be generated unless 3 out of 5 keys are used to sign it. This protects the funds received from any one point of failure, whether theft, the loss of a key, or the inability of one holder to access the wallet. Three of the keys will be held by the Synereo founders. One key will be held by Meni Rosenfeld, the Chairman of the Israeli Bitcoin Association, and one of the most trusted figures in the crypto community. Another key will be held by another trusted third party, to be revealed shortly. Participants wishing to contribute in fiat may do so by sending a wire transfer to Synereo’s company bank account. All details will be available on the crowdsale page, at crowdsale.synereo.com. We will periodically post the information of such received funds with the details of the contributors hidden. The Omni Foundation will receive read-only access to Synereo’s bank account, certifying that the wires reported have indeed been received.